Global technology giant Toshiba has joined a campaign to raise funds and awareness of Australian children who are sick, disadvantaged or have special needs. For the tenth year Team Toshiba is once again participating in the Not for Profit children’s charity Variety 2012 Bash. This year the event sees teams drive from Balmain in Sydney to Bamaga, at the very tip of Cape York over 10 days. 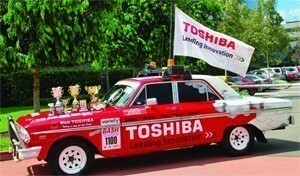 For many years, Toshiba’s employees have supported Variety with the Team Toshiba fleet now consisting of seven participating cars. Captain of Team Toshiba, Les Smith together with Siobhan Minervini from Toshiba’s Medical Division both own and drive Team Toshiba cars. “Visiting regional communities on the annual B to B Bash lets us see just how we are helping the kids in these remote areas gain a little quality of life,” Smith said. Since 2002, Team Toshiba has contributed over $650,000, raising over $120,000 for each of the past three years. Team Toshiba also received the Highest Corporate Fundraiser Award for three years. “Committed to People, Committed to the Future is a catch cry integral to Toshiba’s company initiatives. Toshiba is a long term supporter of Variety and proudly supports the charity’s three core programs: Freedom, Caring for Kids and Future Kids Program,” Smith said. Beginning in Balmain, the convoy travels to Narrabri, crossing into Queensland next day to Goondiwindi and then on to Roma, Emerald and Charters Towers before reaching Cairns, and a lay day. Leaving Cairns the convoy travels to Archer River for a night under the stars before arriving at the final destination, Bamaga, at the very tip of Cape York, a total distance of 4250km travelled in 10 days. For more information about Variety and the Bash click here.